We were in a time crunch because the kitchen was delivered just before Christmas and their stipulation for getting 40% off the counter tops, was that they had to be installed before January 31st. Installed! Yes. And it would take 10 days or so to manufacture the counters after they had templated for them. Which meant that the base cabinets had to be installed before January 20th. Here we have been working hard at doing just that. Usually IKEA suggests that you use their legs under the cabinets and screw on them until the cabinets are level. We chose instead to instal only the front legs and then put the back of the cabinet on a ledge like you see here. Our floors were not terribly even, so this method was a much easier way to do it and would involve a lot less leg fiddeling <---- seems to be my word of the week. Just kidding! Of course we made it. Here are the counter top guys making a template for the Caesar stone counter tops. Ikea set the whole thing up. We just had to call and schedule the appointment. We chose the counter top that is called "Oyster". It reminds me a bit of Terazzo, but in a more subtle way. The counter top people could not stop talking about how level our cabinets were, while they were making their templates. 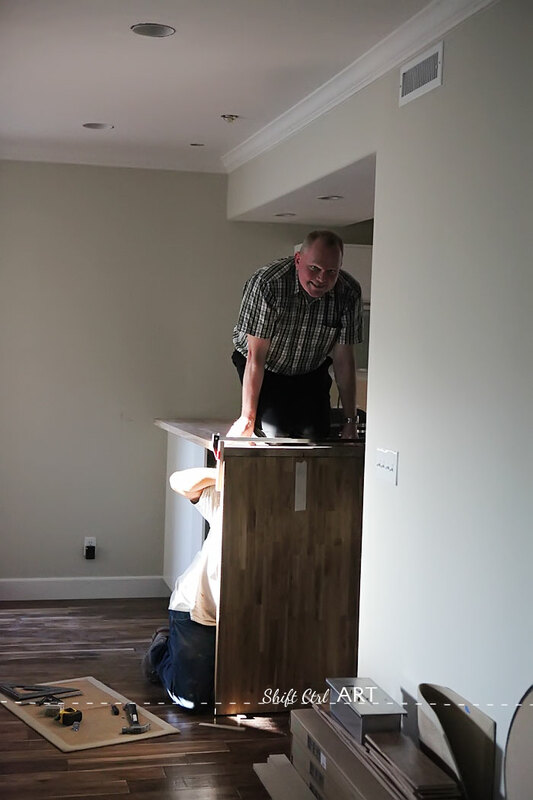 They told us that contractors usually only check for level front to back, but not side to side and on the bias as we had done with our cabinets. Little did they know that not only had we used our level in every direction known to man, I had also subjected each frame to my own little marble test. You see, after living in a bunch of rentals with out-of-level counter tops, I just wanted to be able to put a marble on my new counter and have it not roll off. Is that too much to ask? Here you see the cabinets have gone in for the new breakfast bar. We used the tall 12 inch deep upper cabinets, which we installed as base cabinets. In the original kitchen there was just a wall under the bar top. This house needed more storage like no-body's business. These cabinets are being used for B's school materials on the left and the right side cabinet, I use for candles and napkins. You might have seen this post where I de-cluttered and re-organized my candles and napkins back in January (scroll down just below the picture of the car). But where did we cook in the meantime you ask? We had pulled the old stove out to the middle of the kitchen, but still plugged in. Here B is cooking up a storm. And here you see the new oven, fridge and pantry wall. That fridge used to be over where you now see an opening to the hall way - where the small ladder is. Here is a wider shot of our dining room and kitchen and you can see that we used our camping table in the dining room for a kitchen table - don't judge the mess. Actually... just go ahead.. ha ha. Phew... such is life during a remodel. Here the counter tops have been installed and we are in the middle of installing the roll front cabinet in the corner. That is dh and our contractor is lending a hand lifting it up. We had chunky shelves built between the roll front cabinet and the wing wall. They will be shown in the reveal post. Here the new fridge comes rolling in. And check out our handy make shift blue tape handles on the left of the picture. That was before I settled on the handles we have now. We went with the TYDA handles from IKEA. Here the butcher block return on the bar has been installed and most of the flooring has gone in. It is now around May/June of 2011. We were working on so many things simultaneously, so as soon as the kitchen was functional, the finishes took a bit longer and we were waiting for the flooring to go in as well. Instead of traditional upper cabinets, we built some double cabinet out of two horizontal cabinets first with white filler panels around them, then hung them as one cabinet. Here you can see dh holding one of those cabinets while I take a picture. We put up two of these, one on either side of the vent hood. You can also see that the hood vent has a square extension piece installed on top of it which makes it look like the hood extends all the way up to the ceiling. This was a look I had really been wanting for our kitchen. We bought the extension piece, but it was one inch too tall for our space, so what to do? I searched around for a while and then found a place that cuts metal and powder coats truck beds (! ), and I took it over to them and for $40 or so, they cut off a 1 inch strip of the metal all the way around so the extension piece fit perfectly. Here it is without the extension piece so you don't have to scroll back up a whole lot. And here you also see our induction cook top has been installed. Here we are using dh as a feather weight to hold down the bar top - NUMERÄR from IKEA. This was also 40% off due to the special they ran. I think we ended up saving a little over $3000 on counter tops with that deal. Woot!! Here is the progress picture again. You notice the absence of the uppers and the shelves and such... but this was the nicest progress picture I had before the reveal. The reveal... that's for next time. Maybe next Friday? This article: IKEA Kitchen remodel: Putting in the new IKEA kitchen first appeared on http://ahomefordesign.com.